Description: In this design the pinwheels remind me more of flowers than traditional pinwheels. 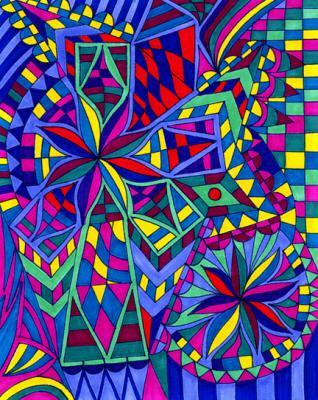 I see two pinwheel flowers surrounded in the garden by plants of many colors and shapes. The garden is alive with color and offers a vibrant and exciting mood to the observer. Imagine yourself standing outside in the garden. Let your mind wander and feel the breeze, watch the flowers move in the light breeze, and let the many colors of the garden fill your mind and heart with peace.